SNES EarthBound (USA) "check glitch" in 09:01.77 by pirohiko & MUGG. 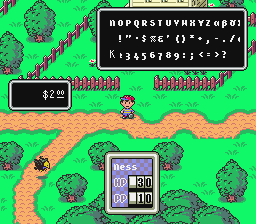 EarthBound, also known as Mother 2, is a great RPG, designed by Shigesato Itoi in 1994-1995. It is best described as "random," but in a good way. The game has a great emphasis on humor; indeed, many things in the game are almost caricatured, from subplots to characters. It also has a versatile soundtrack. MUGG and pirohiko improved their previous TAS by 21:40.34 by finding a faster and more reliable method to access the debug menu and using it to skip most of the game, including the credits.